From October through to the New Year, fireworks will be going off. Although great to watch, firework season can be a very stressful and frightening time for many of our pets. Preparing in advance before fireworks start can make a big difference. To help you, we are running two great offers in practice on FELIWAY® and ADAPTIL® in association with Ceva. Buy 3 FELIWAY® or ADAPTIL® items* and get the 4th item free**. 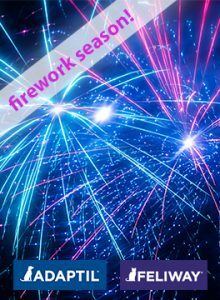 Fireworks can be difficult for many pets to cope with but there is a lot that can be done to support them through this troubling period. For further information please do not hesitate to contact us. Don’t forget… Healthy Pet Club members get 10% OFF all products and services! Offers expire on 31st December 2017. Ceva reserve the right to amend or withdraw these offers at any time. Buy 3 FELIWAY®/ADAPTIL® items* and get the 4th item free** – FELIWAY®/ADAPTIL® loyalty scheme and fullfilment of free of charge item is only valid when purchased through veterinary practices. Allow 14 days for product to arrive after receipt. Free of charge product must not exceed the price of purchased items. Items need to be purchased from the same vet practice. Your data will only be used for the purpose of sending you your free gift and will be destroyed. Buy a FELIWAY®/ADAPTIL® diffuser or an ADAPTIL® collar and get a spray free – FELIWAY®/ADAPTIL® FREE spray is only valid when purchased through veterinary practices. Allow 14 days for product to arrive after receipt. Only valid in CVS veterinary practices. One free spray per household. Your data will only be used for the purpose of sending you your free gift and will be destroyed. ***Offer not available with ADAPTIL® Express Tablets, ADAPTIL® spray, FELIWAY® spray or FELISCRATCH by FELIWAY®.